This brief is concerned with the fundamentals of corrosion of metallic materials and electrochemistry for better understanding of corrosion phenomena. Corrosion is related to both the environment and material properties, induced by electrochemical reactions at the interface between metallic materials and the environment as in aqueous and gaseous phases. In order to understand corrosion phenomena, knowledge of electrochemistry is thus required, and to investigate the cause of corrosion damage, appropriate electrochemical experiments must be performed. Corrosion scientists should therefore possess knowledge of both electrochemistry and its related experimental techniques. 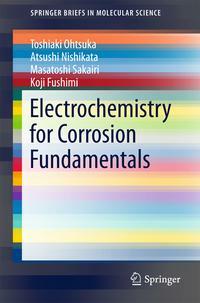 In this book, corrosion phenomena are introduced from the electrochemical aspect. Electrochemical techniques for the study of corrosion are then described with other techniques that can be combined with electrochemistry.? ion and electrochemistry, it is accessible to undergraduate students as well as to graduate students who are beginning corrosion research.